This and That Blog - London lifestyle, food and travel blog. Welcome to post number one of many of our Australia trip. It’s been six years since my last visit to this glorious country and I managed to fit a whole lot of adventures into my two weeks. So be prepared to see posts for the next few weeks (or months depending how quickly I write things up!). It may seem odd to write about something that happened at the very end of our trip first, but that’s just the way my brain works! 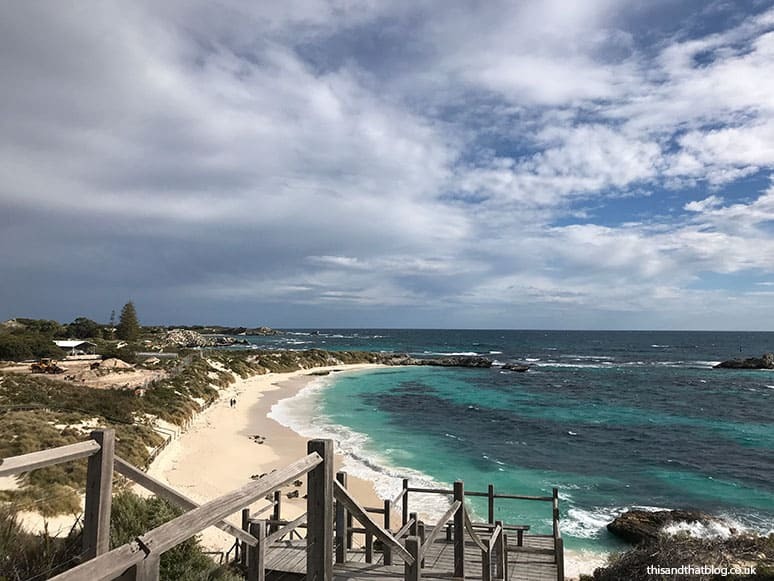 Rottnest Island is in Western Australia off the coast of Perth, it’s a protected nature reserve that is home to white sandy beaches, hidden coves and the Quokka, a wallaby like marsupial that runs wild on the island completely free from any predators. In all honesty I hadn’t heard of Rottnest before I was planning this trip. But my lovely friend, who visited Perth in January, told me it was a must for this trip. So as usual I listened to her and organised a trip across to the island. And guys it was totally worth it. Our ferry across to Rottnest left at 8:40am so we left the hotel at 8 for a casual stroll down to the quay. On the way we picked up breakfast muffins and coffee because breakfast is probably my favourite meal of the day. Once on the ferry we settled down on the top deck for a slow meander down the river to Freemantle harbour. 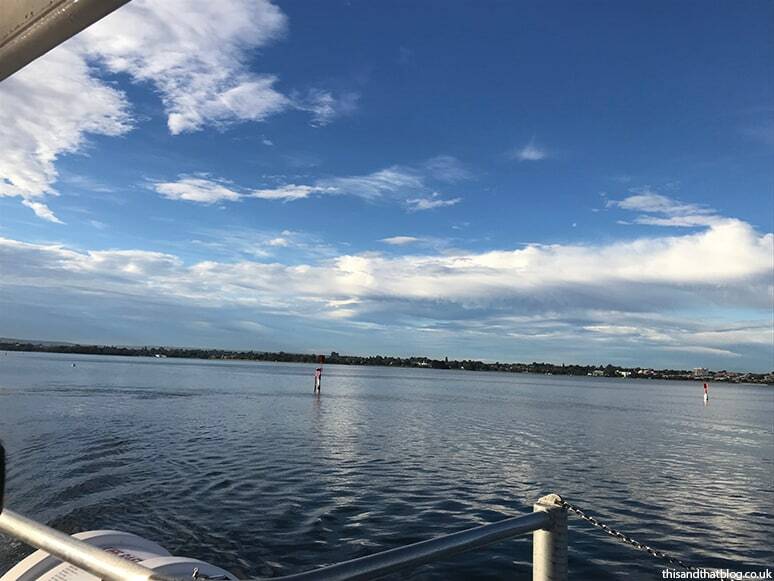 It takes an hour to get to Freemantle so we sat back and listened to the tour guide tell us all about the river – spoiler it was absolutely fascinating. Also we saw dolphins in the river so yeah, a pretty excellent way to start the day. Once we hit Freemantle harbour all river speed restrictions were lifted so we were soon zipping our way across to Rottnest Island. It’s a 30 minute trip across the sea and let me tell you it was a little choppy. I wasn’t a huge fan, but we arrived soon enough. Also the journey back was a lot calmer, so I think the morning trip was just particularly windy. As we disembarked from the ferry we picked up our bikes and set off to explore the island. There are a few different cycle routes available so we opted to explore the small shopping area first. We picked up drinks and lunch and said hello to the Quokkas (more on these later) and then headed north to Mushroom Rock Lookout and Bathurst Lighthouse. Have you ever seen such coloured water? I mean seriously. And this is winter in Australia! From the lighthouse we headed back to the area of shops and picked up the main road out to the rest of the island. The boat we sailed across on had some information about the island and with that was three different cycle routes. We picked the 10km route (there’s also a 4km and 22km) as we figured it would give us lots of things to see but also give us time to chill out and stop at places along the way. Which I think was a good option, although the island is quite small so we probably could have done the 22km route and still have taken our time. But with a particular time to get our ferry home we opted to be cautious. Rottnest Island is just gorgeous and once you get away from the shops and main jetty area it feels utterly untouched by humans. Yes there’s a road that you are cycling on and the odd rubbish bin or bus stop, but nature is just all around you. From hidden beaches, bushland, lakes and rocky coves. There’s just so much to see. I think my favourite view was this one (above) on the beach with one lone seagull saying hello. So Quokkas. What is a Quokka? Well it’s only possibly the cutest thing on the planet. And also the reason Rottnest Island is called Rottnest. When the island was first discovered these little marsupials were everywhere, but the Dutch sea captain thought they were rats, so named the island after them! These funny creatures look a bit like a wallaby and they are super friendly. They have no predators on the island so they’re everywhere and are super friendly to the humans that visit the island. I utterly fell in love with them. And they popped up randomly all over the island. 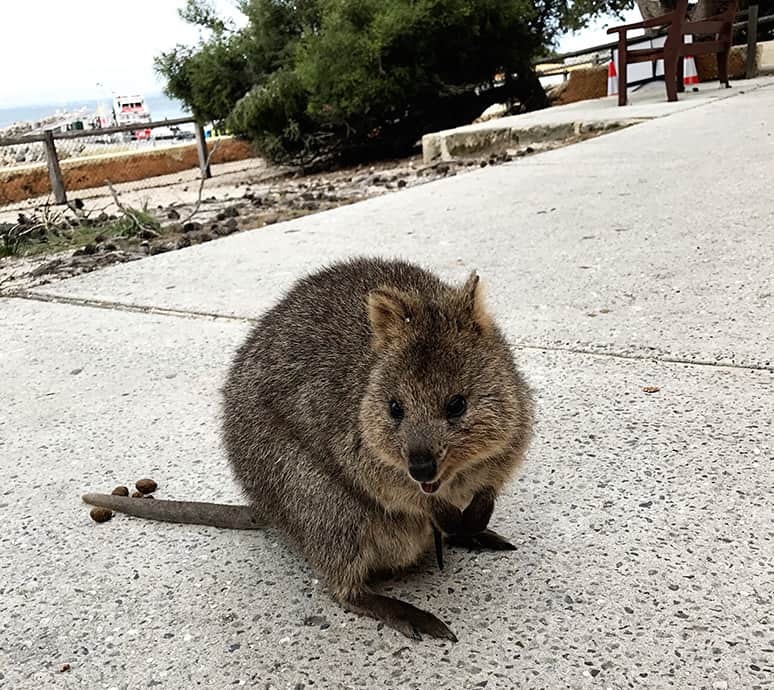 Now we may have acted cautiously when choosing our cycle route, but that meant that we were able to spend lots of time with the quokkas and also check out the Island museum which was fascinating. Oh and the ice cream shop. Winning at life right there! I opted for a cone with one scoop of mint chocolate chip and one of coffee and it was delicious. Armed with ice cream and coffee (winning combination) we say on the main beach and watched the world go by. It was super relaxing and an excellent way to end our trip. Obviously it was winter when we visited so it was lovely and quiet. I can imagine that it’s full of tourists in the summertime and I’m not sure if I’d have liked it quite so much in that instance. I’d highly recommend a visit to Rottnest Island if you’re ever in Perth. I’d love to go back and actually stay on the Island for a couple of nights; it would be the perfect opportunity to do the longer bike route; take more photos of quokkas and eat more ice cream. 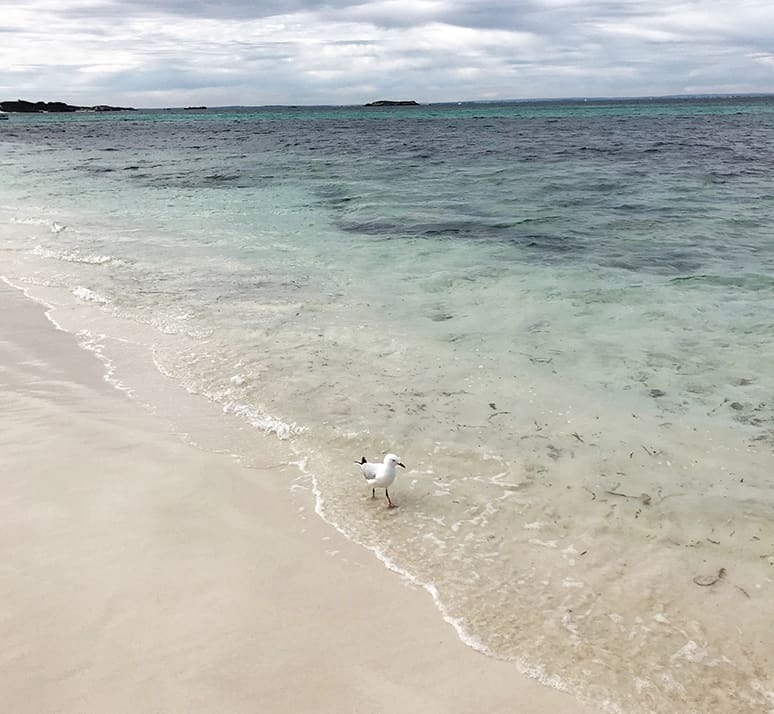 Have you ever been to Rottnest Island? If not have I now sparked the travel bug in you so you’ve added it to your travel list? Hi team and happy Friday! Hasn’t it been the most glorious week? 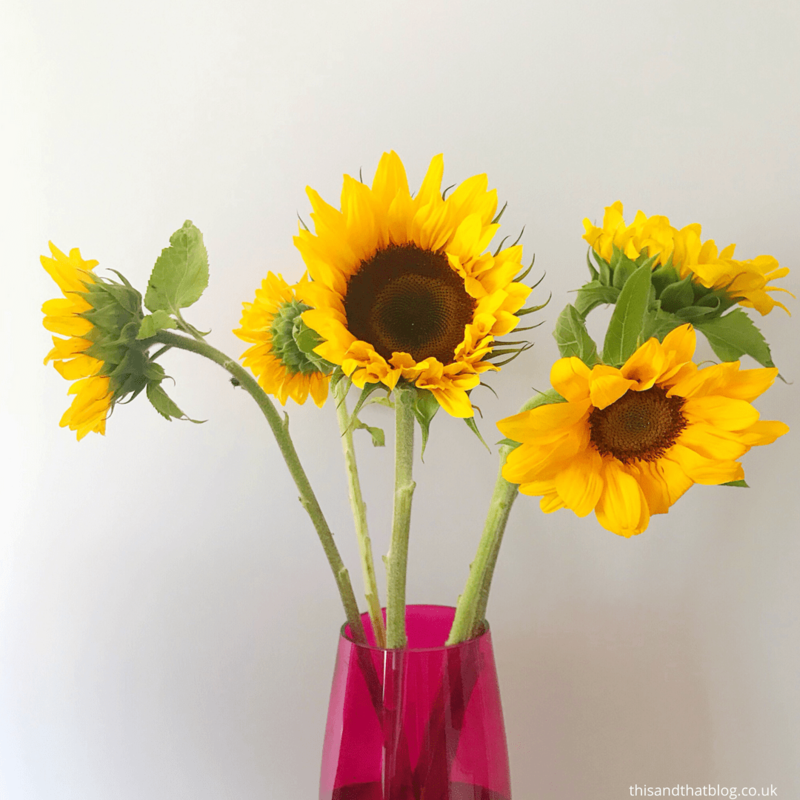 So it seems apt to be sharing my Friday favourites with you all. Read on to see what’s made me happy this week. <> First off I have to mention the football, wasn’t it just incredible to see such a brilliant England team make it to the semi final of a World Cup? I’m so freaking proud of them. And not only did they make it to the semi finals, they were also an England team to be proud of off the pitch. There have been no scandals, no bad behaviour and they’ve become the most brilliant team. I’m super excited to see what they do at the Euros and then the next World Cup – just imagine! <> To tie in with the football on Saturday we had friends over for board games, football watching and a picnic style spread and it was glorious. Honestly best friends and picky food is the best combination. Especially when it also involved a long overdue catch up. Yeah for having a football related excuse to make it happen! <> Number three on the Friday favourites list is the weather. God, could I be anymore British?! The weather’s been lovely and not so muggy, which let me tell you has made a big difference to my days. It’s just so nice not to feel sweaty and gross all day! <> Kind of related to the hot weather is my next Friday favourites item – making a day bed/den situation on Sunday. We inflated out giant air bed and piled it up with all the pillows and cushions and vegetated in the coolest room in the house in front of Netflix. It was the dream. Honestly I hadn’t realised how much cooler our back room was – it made a nice change from being in our sweltering front room parked in front of a fan! <>Are there any prettier flowers than sunflowers? I’d say no. I mean they just instantly cheer me up. I wish they existed all year round. 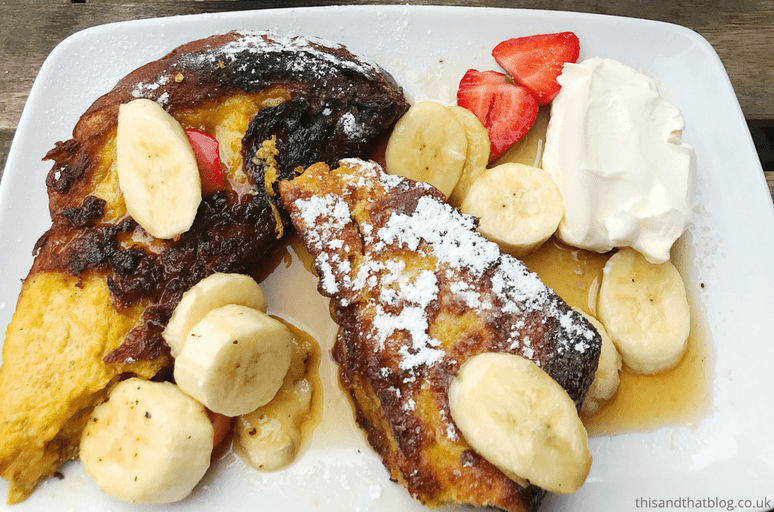 <> Brunch is always a good idea, so of course that once again makes my Friday favourites post. I mean a plate of pancakes and an iced coffee is always the one, right? I’m fast becoming a big fan of our local Blackbird Bakery cafe. It’s just so chilled out and full of yummy food. So there we go, that’s what’s been making me happy over the last week. What about you, what delightful things have been happening for you? This book got me out of a mini reading rut, as it was super easy to read, was full of excellent twists and pulled me in from page one. A little disapointing in that the twists weren’t wholly unexpected but a good book nonetheless. I really didn’t like this book at all. I felt like the characters weren’t fully realised and the story was really forced and unbelievable. Which was really annoying as I adored Ruth’s first book, The Keeper of Lost Things. Don’t you hate when that happens? This was one of my favourite books of the year. Simply brilliant. It’s about a teenage boy who is a gifted musician who hates playing the piano thanks to an abusive mother with a failed music career who forces him to practice all the time. It sounds like it would be horrifying, I agree, but in actual fact it’s a beautifully written tale and so uplifting. Yes there are harrowing scenes but it’s so good it’s worth persevering with them. I love Sophie’s books for their easy, unputdownable reading. And they always seem ideal for the summertime. This one was no different and it’ll make the perfect beach read. It’s about a long-married couple’s attempts to make things less monotonous by surprising one another more often. Little do they realise the events that’ll unfold as they start to do new things. This is the most beautiful tale of magic, family and facing your fears. It follows a young boy who goes to a remote island for the summer to stay with his grandfather, there he discovers family secrets, age-old hidden magic and that he might just be destined for greatness. It’s beautifully written and weaves a magical tale while also dealing with big issues – like depression and Alzheimers. It’s a stunning read. This was read one of the holiday, and what a way to start! It was brilliant. It was twisty, dark thriller of a book that kept me guessing right to the end. Granted I did see a few of the twists coming, but not all of them. It’s quite graphic and wrong at times but still a great read! 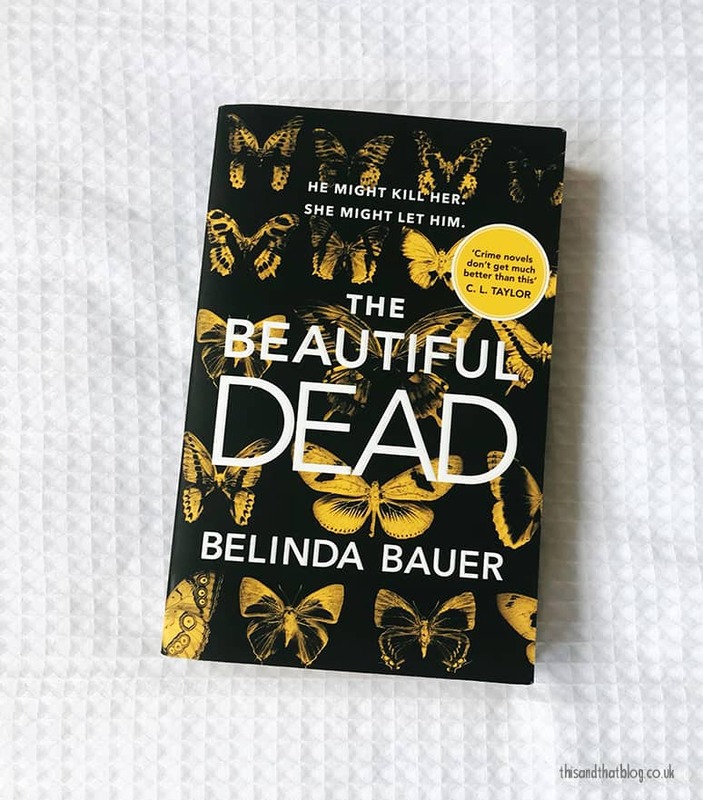 This book had such an interesting premise – that people live to be 250+ years old thanks to advances in medicine and the world’s obsession with perfection – however the characters didn’t quite work for me. They weren’t developed enough and didn’t seem to act how I’d expected them to. I did really enjoy exploring the morality and concepts of what it means to be alive and the world’s obsessions with perfection and living a long life, but those bits let it down a little. Plus things were a little too neatly resolved for my liking. Having said all of that I still enjoyed this book and raced through it. You should definitely read it! I loved this book! It was an excellent thriller with twist after twist to keep you guessing. And even though I guessed the big twist it was still enjoyable. It tells the story of a mother who wakes up from a coma to learn that her husband’s left and her daughter’s dead after their car was swept into a river. It’s one of those books where you really can’t decide who is right and who is wrong, as much as you want to belief in certain characters. It’s so good! This was a fascinating book and it’s really made me want to revisit the original greek myths as I don’t know enough about Circe. She’s such a fascinating character and I really felt like I was in her world with this book. It’s brilliantly described and such an interesting take on the mythology. Circe tells the story of a daughter of Zeus who doesn’t have any powers, other than magic, which is certainly frowned upon by her fellow gods. She is also fascinated by mortals, another no go in the world she’s born into. Thanks to the magic and mortals she’s banished to an island where she’s left to her own devices and is able to hone her magical skills. Here she also crosses paths with a number of mythical figures – Icarus, Medea and the Minotaur. This is such a great book – it’s a fictional murder that takes place in the world inhabited by the real Mitford Sisters, when they’re young children. One of their nannies and the eldest sister hear of a murder and work to uncover what really happened. How is the family involved? What’s it got to do with the Great War? And will anyone take them seriously? It’s such a great book and I really hope they’re doing another one soon! 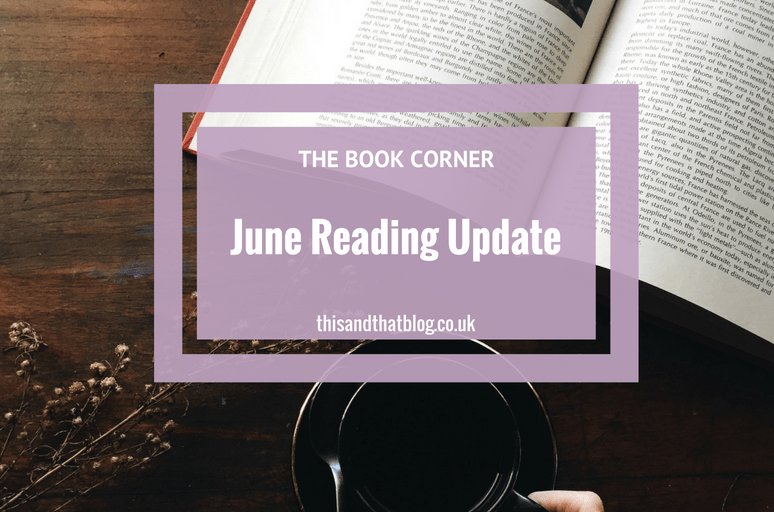 So there we go, my ten reads from June. Have you read any of them or have I encouraged you to pick any of these up off of your shelf? I think Friday is probably my favourite day. It’s the end of my working week and the beginning of the weekend. It’s got a wonderful amount of anticipation attached to it, that I love. This Friday is a particularly good one as I have a takeaway and football planned for tonight. And then some excellent weekend plans. Last weekend I was jet-lagged and utterly incoherent so I’m looking forward to actually being able to function properly this weekend. But before that happens I need to finish and publish this favourite things list. So I’d best get on with that! <> The summer weather. I can’t write a favourite things list without mentioning the glorious weather that we are currently experiencing. I mean talk about a heatwave! Although I have to admit I’d be much happier if I didn’t have to do anything in this heat. A few days relaxing in my garden would be ideal. <> World Cup watching. Gosh I love football. I mean I don’t watch it religiously anymore but I do absolutely love a tournament like the current men’s World Cup. This past week I have watched as many matches as possible. For the weekdays that means the 7pm games. My after work routine has become: get home from work > throw open all the windows and turn on all the fans > prep an easy dinner – basically a quick pasta dish or a random selection of bits from the fridge combined to form a salad > settle down in front of the TV by 6:50pm to watch the anthems and the game. And what epic games they’ve been! That Belgium Vs. Japan game was a battle and a half and the Denmark penalties were edge-of-your-seat stuff. I can’t wait to see what’s next. <> Back to work. So yes my Australia travels are well and truly over, which I think I’m just about coming to terms with. While I am sad not to be visiting family and friends or exploring new cities, I am however a little bit happy to be back at work. Yep I said it! But you know what, I enjoy my day job and sometimes going back to normality is exactly what is needed. <> Summer salads. In this weather cooking anything is a bit of a hassle. It’s just way too hot to be standing near an over. Which means my meals this week have taken the form of salads or leftovers. Or last night just two bowls of cereal. 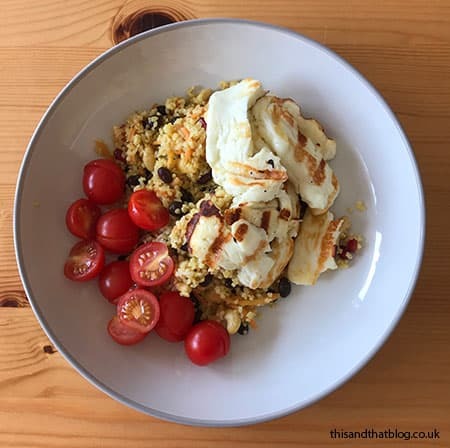 On Sunday Fi made her staple bulgar wheat salad filled with black beans, carrot, pomegranate seeds and crunchy nuts. This coupled with halloumi and a whole heap of tomatoes made for an absolutely delicious meal. I’ve since had the same salad base for lunch three times this week. <> Jetlag. Okay it’s a bit of an odd one for my Friday favourite things but hear me out. I have jet lag, like wake up at 4:30am every morning jet lag. And while it’s frustrating to miss out on sleep, because we all know how much I love sleep, I have actually been enjoying these earlier starts. Okay so I’ve not done anything super productive with them – i.e go to the gym or for a swim, but I have been making the most of reading my book or pottering around the house or breakfasting at home. It makes a nice change. <> Iced Coffee. It’s the only option in this stifling heat. And honestly is there anything more delicious than an iced coffee on a warm morning, especially when you’ve just stepped off a sticky tube? <> Turn on Prime. I’m currently on episode eight of the first series of Turn. It’s all about the spies of the American Revolution. It’s filling a Hamilton-sized gap for me right now. Not that I’ve seen Hamilton yet, but George Washington and Charles Lee have both made appearances so who knows who will be next! What would make your list, tell me and make me jealous! If you’re a regular to this blog or my Instagram page then you will probably already know about my obsession with Brickwood. 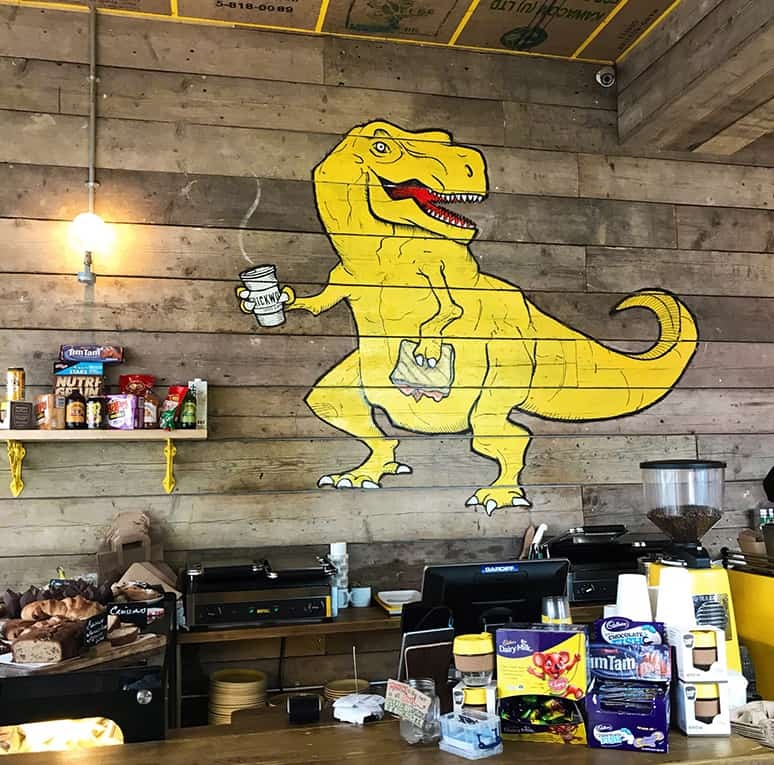 It’s an Australian themed cafe in south London that I have always been a fan of. Last year it finally made it’s way past Clapham and opened up in Streatham. Brickwood, Streatham is a bright yellow cafe right on the high street, it’s a small space, but it goes back quite a bit and has four or five outside tables (at the front and round the side). Also a plus point is that it’s near the bottom of the high street rather than the top. This is particularly exciting because it’s a 10/15 minute walk away from my house. Which is a big deal when I tell you that most of the other cafes and brunch places are at the top of the high street and I therefore need to get on a bus to get to them – not fun when you’ve got a craving for coffee that the homemade version cannot satisfy. So what is Brickwood all about and why should you check it out? Well it’s an Australia coffee chain so it’s got that endlessly cool Australian calm vibe about it. Plus the coffee is good, the food excellent and the staff are always happy. It’s a wonderful reminder of just how good the Australian coffee culture is. Fi and I have gotten into a habit of both going for a run (separately) and meeting at Brickwood at the end. This means that we can both run for as long (or as short) as we want and not keep the other one waiting in some random place. Plus it means a post run brunch of epic proportions. Drinks wise this is the only place in London apart from GBK where I can find the New Zealand drink L&P. It’s a delicious and refreshing carbonated drink that I fell in love with eleven years ago. So that right there is a reason to stop by. Then there’s the coffee, because we all know how much I love coffee. The iced coffee is perfect and so are the flat whites. So if you’re stuck making a decision go with one of these. Now onto the food. It’s the all important factor after all! You honestly can’t go wrong with anything from Brickwood. I would personally recommend the ham hock and cheese toastie, it comes with a truffle mustard mayo which takes the sandwich to another level all together. Fi is a big fan of their smashed avocado and poached eggs on toast – which looks amazing, but I don’t do avocado so can’t comment on the actual taste. But the two of us totally agree that the french toast is amazing. It’s light and fluffy and comes with either bananas & strawberries, or bacon or, both. Also if you’re feeling up for it order a side of hash nuggets to go with your brunch. These perfect potato nuggets are utterly moorish. Then if you’ve still got room left opt for a cake or two. The banana bread is another favourite of Fi’s and seeing it in the cafe reminds me how popular banana bread is in Australia. I wonder why it isn’t in more cafes and brunch places in the UK? Maybe Pret should get on that? Anyway the pièce de résistance at Brickwood is the Tim Tam muffin. Yes, you read that right. This delicious morsel is a chocolate muffin with a whole Tim Tam baked inside. And if you don’t know what a Tim Tam is then you need to get to Brickwood asap. I feel that I might be about to say an unpopular opinion, so bear with me… I love long haul flights. Don’t get me wrong if I could speed up air travel and be in Australia from England in just five hours I’d be all over that. But seeing as that’s not the case I’m so on board with a long flight time. Good job really, as I’m currently in Australia (have I mentioned this before, I’m not sure!) and have two long haul flights to come this weekend to get me home. The joy in a long haul flight isn’t just because you’re heading off on an exciting adventure. It’s also about that lovely freedom you have when you’re up in the air. You don’t have anything you have to be doing. And you can doze or read to your heart’s content. 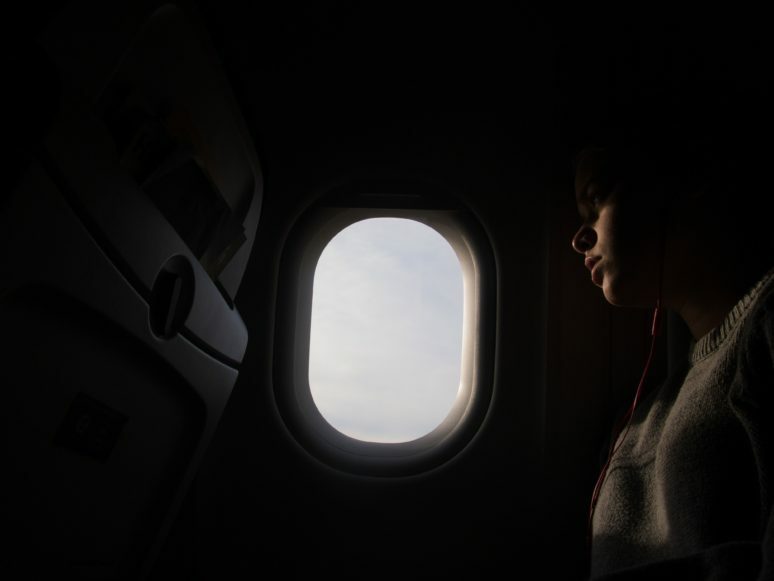 Having said that it can be a complete pain at times, so here are my top tips for long haul flights. This is perhaps the most important tip to ensure you feel yourself on arrival. Drink all the water you can find. It genuinely does make a difference and will have you feeling so much better on arrival. Definitely don’t just make do with the tiny bottles they give you once every three hours. Take your own bottle with you and fill it up hourly. These days the in-flight entertainment systems are pretty good and you’re bound to find two or three films that you want to watch, but what’s really important is that you have lots of other options as well. Just in case your TV is the one that breaks (been there, dealt with that) or in case the films aren’t that good. I always have my Kindle so that there are multiple books that I want to read at my disposal, at least one magazine from WH Smith at the airport and a whole host of shows or films downloaded onto my iPad. That way I can switch between forms of entertainment to my heart’s content. So I might read for an hour, then watch a film, then browse the magazines, before settling down for a couple of episodes of my current Netflix obsession. It really is the only way to survive a long haul flight. Plus it’s fun as I’d never normally allow myself to get stuck into a book or TV show for 7+ hours without taking a break! These are an actual necessity. Headphones that block other people out so you can read, sleep, watch TV in peace for as long as you want. Ain’t no one want to listen to a hacking cough, someone’s sniffles or any other such thing for hours on end. Headphones are the only answer. I have absolutely no care about what I look like while travelling. I’m all about the snuggly socks, big jumpers and comfy trousers on a plane. Plus I’ll probably plait my hair or leave it lose, no matter how greasy it is. On a long haul flight I’m all about the comfort. It’s most certainly not a fashion show. I can’t imagine anything worse than wearing heels or jeans for 24 hours of a journey that includes long walks to the gate or lots of sitting still. That’s definitely not for me. Now we’re on to the holy grail of long haul travel. The wonder that is sleep. I’m not normally someone that can sleep on planes, it’s just never something I’ve been able to do. But I always live in hope that I will be able to as the one or two times I’ve been able to sleep for big chunks of time, it’s been a life-safer. You feel rested and you don’t have a chance to get bored. The actual long haul dream, am I right?! Do you have any top tips for surviving a long haul trip? What always works for you? A few months back I shared this list of my top 21 things to do in London. 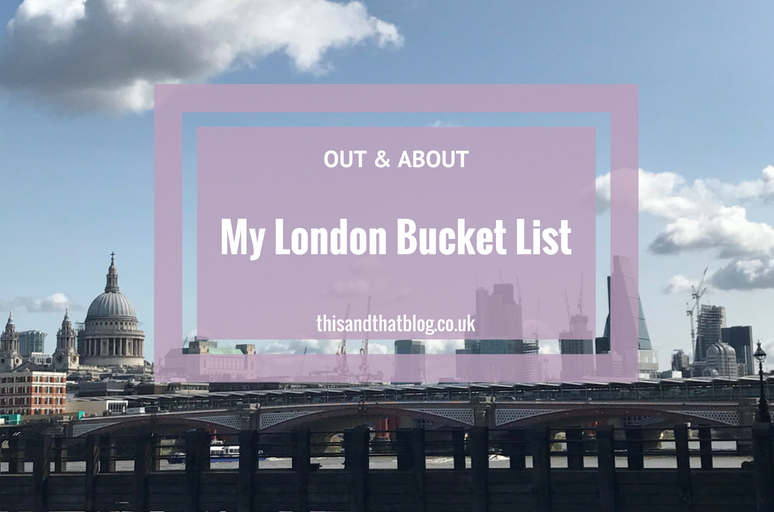 From running along the Southbank, to watching a play at the National Theatre and afternoon tea at Sketch, that London bucket list list was all about my favourite things to do in London town. It’s the list I share with anyone visiting the city, and I feel like it’s a finely honed view of the city. But it’s not everything. You see there are plenty of things to see and do in London that I’ve still never done. Some are classics, some are slightly obscure, but all are things I’ve yet to experience in the city. And that’s what this London bucket list is for. The hope is that if I write these down I will actually get around to ticking them off one day soon. Afternoon tea at The Ritz – I absolutely love an afternoon tea session and this one is a classic that must go onto the London bucket list. 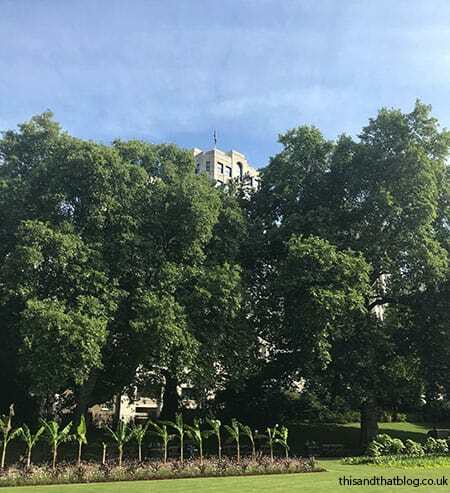 A trip to the Imperial War Museum – I’ve not been since my school days, but I loved it then so I’m sure I’ll love it now. Visit Hampstead Heath – how bad is it that I’ve still not been here?! I want to take a picnic and while away a whole day just watching the world go by. Tour the Houses of Parliament – It’s an iconic building and a pillar of our democracy, so to step foot inside would be absolutely fascinating. A trip up the Shard – You can see the Shard from all over London, but I still haven’t seen all of London from the Shard. I’m intrigued to see what the building is like inside and what the city looks like spread out so far below. Visit the Churchill War Rooms – Especially after watching The Darkest Hour the other week. I’m even more intrigued about these rooms and the history I will uncover on a trip there. Broadway Market – One Saturday morning I’m going to get up early and make my way across London to have a wander around Broadway Market. I’m planning to look at all the stalls and then eat all of the things. The Barbican – Still not been here. But one day I will see or do something (anything) at The Barbican. A duck boat tour – Yes it’s super touristy, but there’s something quite nostalgic about a trip along the Thames on a yellow duck boat. Do you have a London bucket list? If so what’s on it? Greetings team, and how are you all on this wondrous Friday? I’m half way around the world in Sydney at the moment having a lovely time so I thought I’d pop in with a special edition of our Friday Favourites post, just so you remember us while we’re away! What makes this a special edition of Friday Favourites I hear you cry? Well I wrote this two weeks ago, before I gallivanted off on holiday! So rather than a completely correct Friday favourites it’s the things I was most looking forward to on my holiday ahead of leaving. So it’s not up to date – it won’t count any particularly excellent road trip moments or sites we’ve seen so far, it’s just what I was excited to do on this holiday. First up on this special edition of Friday favourites has to be seeing family. That is after all the whole point of coming on this trip in the first place! We’ve got four days in the Sydney suburbs, kicking off today, and I could not be more excited to see my Nanna, my cousins, my second cousins and my aunt and uncle during that time. It’s been six years since I saw most of them so there’s lots of catching up to do. I can’t wait. As soon as we’d decided to visit family in Australia I knew I had to fit in a trip on the Great Ocean Road while out here. I’ve wanted to visit every time I’ve been in the country and we’ve just never found time to do it as there’s always so many people to see. But this time we’re making it happen and I could not be happier. I’m excited for the road-trip element, for seeing all the stunning scenery and just general exploring the Great Ocean Road. Have you ever been? Before we head to visit family we’re making a Sydney detour to visit that gorgeous city – one of my favourites ever – and visit with friends. It’ll be so lovely to see them in their new homes and to see their lives in real life instead of an Instagram lens! So far we’ve organised all our catch ups around food, but what else would you expect?! Number four on my Friday favourites post is staying in a nature park surrounded by wallabies and koalas. Yes, this is actually happening! The idea is that we’ll wake up and they’ll be carrying on their normal business all around us – I can’t wait to see all the Australian animals in their natural habitat. How awesome will that be? Another great thing about this trip, and why I’ve been looking forward to it so much is that the first week of the trip is just my sisters and me road-tripping and exploring together. It’s going to be such fun to just hang out with them and explore Australia. Thankfully they have similar musical tastes so their won’t be any clashes on the road-trip music and they’re all about the coffee stops too, so I’m in good company! Our Australia trip really is going to be a whirlwind, for example we’re not staying in the same place for more than one night until a week into our trip and there’s a lot of moving around. which is going to be awesome of course, but also completely knackering. So I’m very pleased that we’ll be ending our Australia trip in a really nice Perth hotel. It’s fairly central, has a good gym and a beautiful looking pool. And because we’ll be there for four nights I think it’ll feel like a mini holiday in the main Australia trip. So bring on the relaxation before we head back home I say! Have you ever been to Australia? And if so do you have any must-visit places I should add to my list? We’re visiting Melbourne, the Great Ocean Road, Perth and Sydney so please do send suggestions my way! 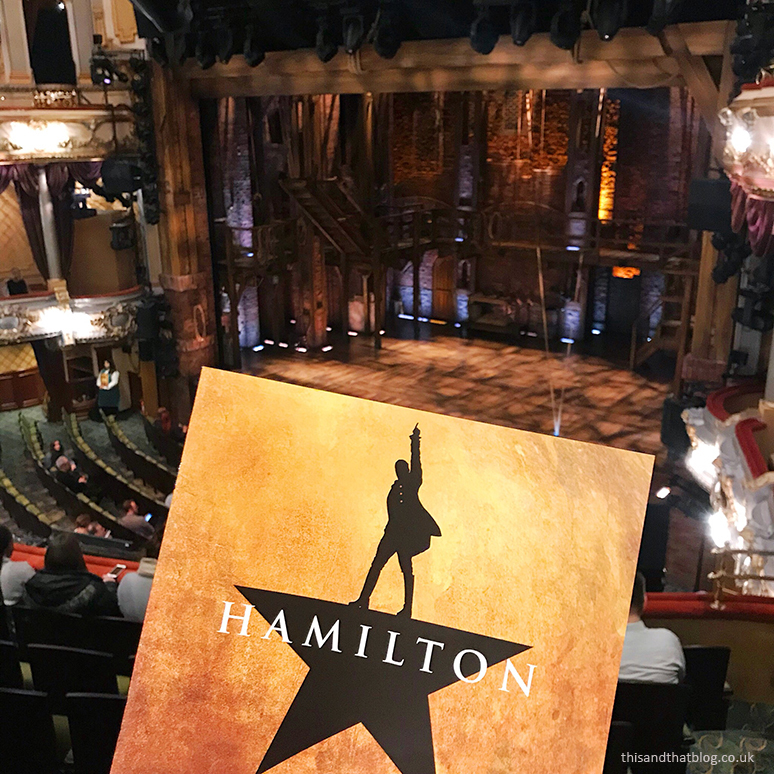 If you’ve read this blog for a while you’ll know that both Lau and I are big Hamilton fans. You surely won’t have missed hearing about our obsession with the soundtrack or our three trips to see it in the space of three months earlier this year. But I’ve never really talked about why I love it, which seems odd considering how much I love it. And as I’ve just booked tickets to see it again, not until next year mind you, I thought now was an apt time. All of the songs of Hamilton are inspired by rock, pop or rap and that makes it unlike any other musical I’ve seen. On first listen you’re instantly hooked on the songs because they sound like the songs you listen to in your free time or the songs in the current charts. So there’s an immediate recognition – unlike some more traditional musicals. Plus because it’s all inspired by popular music you can appreciate the songs separate from the show. You don’t need to have watched it to enjoy the album. Not at all. So if you’ve not listened to the soundtrack yet then you’re missing out big time. Just google ‘Wait for It’ or ‘Satisfied’ and you’ll see exactly what I mean. Yes I’m a history buff, so of course I’d say the history is what makes Hamilton incredible. But it really is the most fascinating story that you’re seeing retold on that stage. It has everything you want in a musical – betrayal, rags to riches, love, friendship, war, misunderstandings, sorrow and so much more. And it’s all based on real people. It’s frankly quite astonishing. The way the play is stage is incredible, at first sight you think it’s quite simple and run of the mill. There’s a wooden balcony and some ropes and that’s pretty much it. But then you discover all the extra bits, plus see all the dancers in motion and you’re blown away. There’s so many bits that you want to rewind and watch again or moves that the dancers do where you’re in awe of. And then there’s the costumes – so simple and so effective. I genuinely didn’t expect to laugh so much when watching Hamilton for the first time. After all I’d listened to all the songs numerous times and knew the majority of the story so where would the humour come from? Well I was wrong! There’s such comedy in it, and not in a slapstick way. It definitely adds something unexpected to the show. So after seeing the show three times and knowing all the songs and the story before we even went I am still amazed that each shows has me gasping at how incredible it is as a show. There are still bits that succeed in surprising me as I’d forgotten how emotional or mind-blowing-ly good the song or the actor was. Or how a particular song is staged. Each and every time I’ve left the show I’ve been in complete awe and that’s just astonishing to me. Still being in awe after three shows. That’s quite an incredible feat, right? Tell me, have I convinced you to book tickets or are you still on the fence about the wonder that is Hamilton? So right now I’m in Australia having (hopefully) an excellent time and catching up with some of my all-time favourite people. That’s why this blog has been a little low on posts recently, because while I planned to get lots of posts written and scheduled in, life didn’t quite go according to plan. Work and life and, let’s not pretend otherwise, packing got in the way! Oh well, never mind. Anyway, here I am with a reading update. 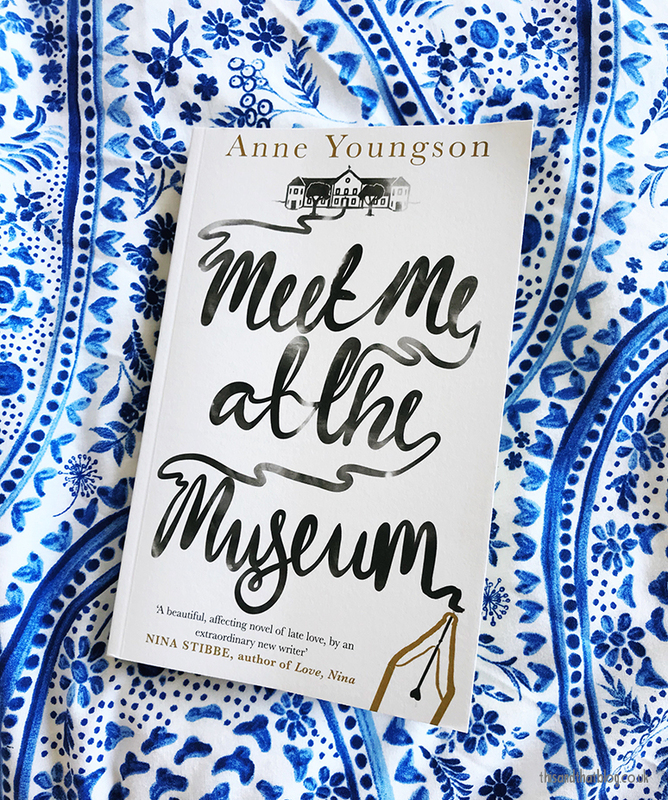 Meet Me at the Museum was an unexpected book for me. It was the work book of the month just as I finished reading The Handmaid’s Tale and needed something completely different – so I picked it up. And absolutely loved it. It’s written in the form of letters between Tina in England and Anders a museum curator in Denmark. It’s a gorgeous tale of friendship, life, regret and love. I honestly could have read these letters for ever. I highly recommend you add it to your reading list. This book is so relatable. It’s honest and funny and brilliantly written and I was hooked from the start. The characters were intriguing and their actions sometimes flawed, but understandable. The way that social media was portrayed was so truthful and it made me think about how I use it. I will definitely be recommending this book to all my friends. I love David Baldacci books. They are the perfect detective mystery novel that I sometimes need in my life. The Fix is book three in the Amos Decker series which sees FBI detective Decker witness a random killing outside the FBI headquarters. From then on Decker and the rest of his special investigations team race to uncover what happened, and why, before something even worse happens. I really really want to pick up book four in this series now. Perhaps one for the plane journey to Australia. Grace and Fury is set in dystopian world where women have no rights. Sisters Serina and Nomi have no choices in the world, they will either become Graces (essentially a concubine for a member of the royal family) or servants. Both have trained their whole lives to take up their roles, but when something unexpected happens things quickly take a turn, leaving both of them fighting for their lives in very different ways. The dedication at the front of this book reads “For every woman who has been told to sit down and be quiet… And who stood up anyway.” which probably gives you an indication that this is about feminism and fighting for what is right. I can’t wait to read the next in the series – be warned the ending leaves you wanting so much more. This is a modern retelling of Austen’s Pride and Prejudice and I should tell you right now that I am not a fan of Pride and Prejudice. Not at all. I just cannot stand the book or the characters – sorry! 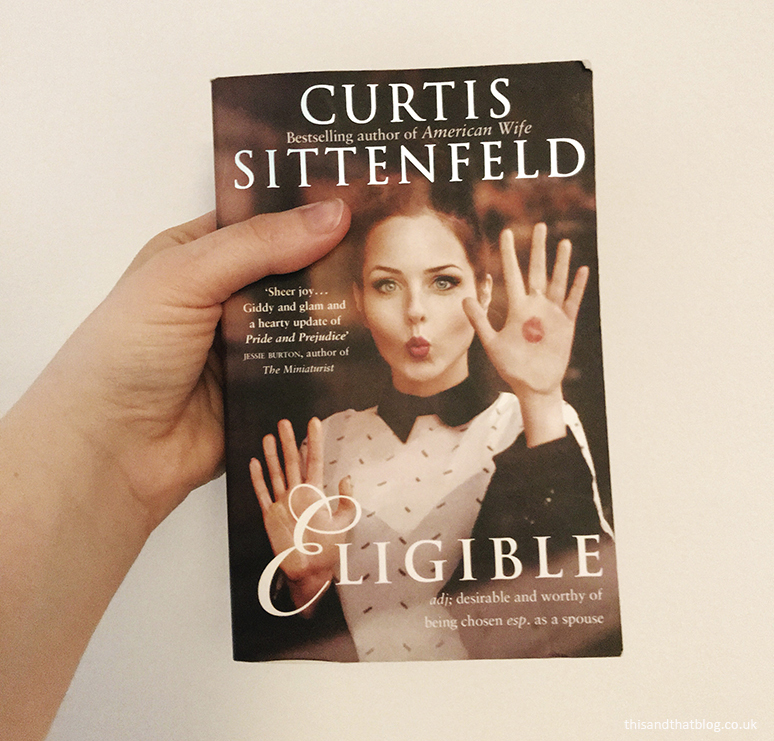 But I have been wanting to read Eligible for a while because I was intrigued and I wanted to try it and see. Well I’m pleased I did, because I really, really enjoyed the book. Set in Cinncinati Liz and Jane return from New York City to their family home after their father suffers a heart attack. From then on their mother is trying to set them up with the eligible doctors from the local hospital. The characters in this are so excellent, I mean some are hideous, but it still works and they’re believable. The story has the same bare bones as Pride and Prejudice but it’s also quite different, and I liked it a lot more than the original. The Whispering Skull is book two in the Lockwood & Co series. Lockwood & Co is an agency specialising in psychic investigations, and this time around they’re investigating a haunted mirror. I first started this book back in January or February and just could not get into it. It’s 450+ pages and after 100 pages I just wasn’t feeling it. So I put it down and read something else. Then after finishing Eligible I decided to give this one another go and of course I was promptly hooked. Book two has everything you want from a kids paranormal detective series – there’s ghosts and ghouls, old stories to uncover, plenty of adventure and new friends to make. I’m now trying to stop myself from buying book three and four until I clear a bit more space on my bookshelves. It’s hard though as I really want to join Lockwood, Lucy and George on their next mad mission! 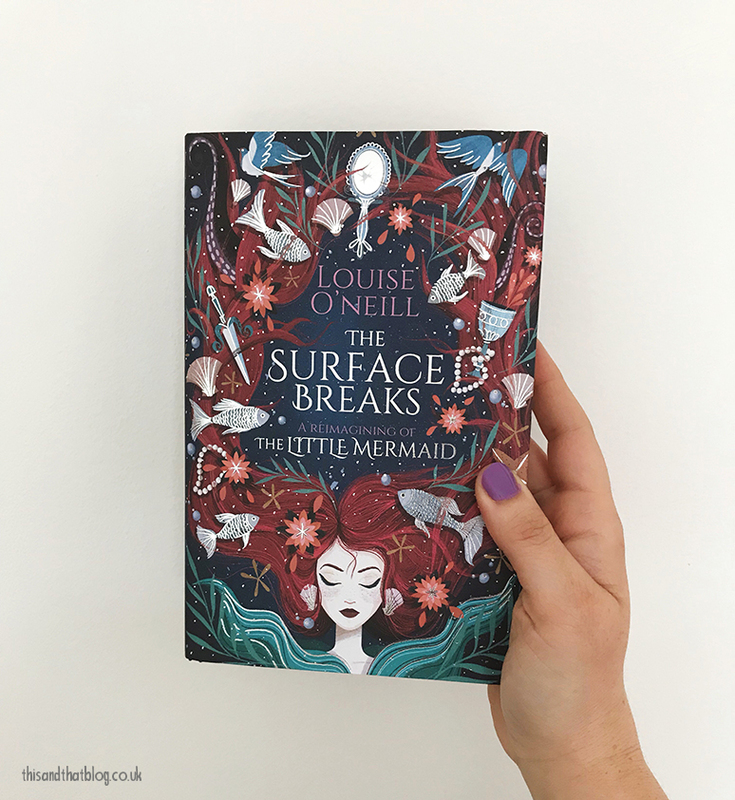 When I heard that Louise O’Neill was doing a retelling of The Little Mermaid, but with a feminist twist, I knew that I wanted to read it, and I knew it would be good. What I didn’t expect was that it would be this good. I raced through this book in one sitting because I just couldn’t find a convenient place to stop. The main character (or mermaid) Gaia is struggling to understand why her mother left her, trying to meet her father’s exacting standards and dealing with a betrothal that she just doesn’t want. On her fifteenth birthday she is finally allowed to break the surface and see the world above the sea. But what happens then will change everything forever. Eve Singer, a TV reporter, covers crimes and murders in London. After covering a gruesome murder she realises that there might be a serial killer at work. And even worse that the serial killer may just be obsessed with her. This is the second book that I’ve read by this author. The other one Rubbernecker is on my list of all-time favourite books. The Beautiful Dead doesn’t disappoint. I was utterly gripped from the start, and I found myself reading this at every opportunity. The crimes are hideous, the suspense is perfectly written and the characters are intriguing and fully formed. In a war torn city Nadia and Saeed meet and fall in love. As the destruction of their city increases doors begin to appear all over the city that are said to transport people all over the world. Will Nadia and Saeed take a chance and step through one of the doors? If they do where will it take them and what will happen next? At just over 200 pages this was a super quick read for me. I thought it was a fascinating look at migration and the choices we make. Maggie wakes up in hospital to the news that her ten-year old daughter Elspeth died in the same accident that caused her coma. As Maggie tries to come to terms with this news she discovers that her husband has disappeared, she has nowhere to live and she’s now receiving letters from her dead daughter. With the help of two new friends Maggie tries to find out what really happened on the day of the accident. This was a definite page-turner for me, I absolutely raced through the book willing Maggie to uncover the truth. There are some big twists and while I did guess the main one I still enjoyed it. The latest book in the Private series sees the elite investigation firm called in to help a British princess find a missing friend. From London to Brecon the team attempt to track down the missing woman. Is she in hiding, is she in danger and what secrets is the princess hiding? I’ve missed a few books in this series, so maybe that’s why I was less bothered by this book. I don’t know. It had the same suspense and cliffhanger chapter endings but it wasn’t as gripping as I was expecting. Maybe I’ve just grown out of this type of book? I guess tastes change over the years. Phew, so there you have it, my recent reading list. It’s another 11 books for me over the last 10 weeks. Which takes me up to 40 books so far this year. So I’m pretty certain that my challenge of reading 50 books in 2018 is going to get a giant tick next to it – and pretty soon! Tune in next month for another round of my recent reads updates.